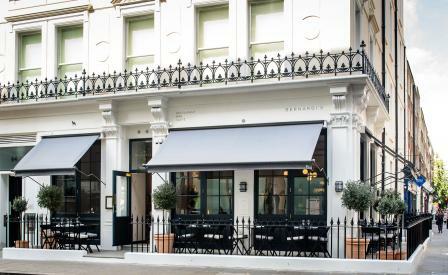 The Australian-Italian brothers Gabriel and Marcello Bernardi – ex-Cubitt House Group – are hoping their new restaurant Bernardi’s will bring an authentic touch of Italy via the Antipodes to London’s Marylebone ‘hood. ‘We both enjoy light, fresh, uncomplicated food and wanted to create somewhere that we could eat in day-in day-out,’ say the duo. It certainly helps that the two-storey restaurant sits on a bright street corner, its freshly painted Victorian façade and large sash windows letting plenty of natural light past the boxed olive trees into the high-ceilinged interiors. Pulling double duty as interior designer Gabriel Bernardi has unfurled an open-plan room furnished in grey and black, natural timber and stone. A large communal table at the rear of the restaurant looks over the open kitchen and bar though, for our money, the best seats in the house are the low-slung leather banquettes by the window – perfect for people watching while mulling over head-chef Sabrina Gidda’s bijou mod-Italian menu. Think veal sausage, sage and chilli pizzette, and crostini topped with olives, white anchovies and duck egg. More unusual plates include a white peach, burrata, almonds and basil salad, tarragon gnocchi draped with a homey combination of rabbit ragu, broad beans and pancetta, and a succulent slab of pork paired with lemon, clams and fregola.